(NEW YORK, NY) – Revolution Golf is celebrating the 40th anniversary of Gary Player’s final Open Championship victory with a special offer on the Black Knight’s critically-acclaimed “A Game for Life” instructional DVD, wherein anyone who purchases the series at AGameForLife.com from July 17 to August 7 is automatically entered into a drawing to win one of 40 autographed copies. Divulging Player’s never-before-seen secrets to better golf, the handsomely-packaged, three-disc box set goes beyond standard golf instruction. It showcases previously-untold tips on sand play, efficient practice, short game, course management and fitness for a roadmap to improved performance. With proven advice on lowering scores now and remaining strong for years to come, A Game for Life (MSRP $99) is available for purchase at AGameForLife.com. Four hours of high-definition content is consumed through a traditional DVD, computer or mobile devices. Digital portability means the Black Knight’s legendary knowledge can be viewed on the driving range, putting green and gym, and put to immediate use. In addition to his 40 years of golf course design, Player currently serves as the Global Ambassador to the World Golf Hall of Fame and holds an Honorary Doctor of Laws degree from St. Andrews University. His legendary career and humanitarian endeavors have been acknowledged by numerous awards, including the 2012 PGA Tour Lifetime Achievement Award, the 2006 PGA Tour Payne Stewart Award, and the 2003 Laureus Lifetime Achievement Award. The three-disc DVD box set of Gary Player: A Game For Life, also available in digital download format, is produced by Revolution Golf. With more than 1.8 million videos served monthly and 60,000 daily, nearly one million members make it the world’s largest online golf learning center. Its community of golfers receives fresh video content daily, from top-name instructors to PGA Tour stars. In addition to Gary Player: A Game For Life, Revolution Golf produces full-length High Definition golf instruction DVDs, motion picture-grade digital shorts, long-form HDV teaching series, camera-to-web instant video shorts, and other digital media created specifically for instant Internet and smart phone applications. New York, NY (June 18, 2014) – Organizers of the Abu Dhabi HSBC Golf Championship, which will celebrate its 10th anniversary next year, have announced the award-winning event will run from January 15-18, 2015 at Abu Dhabi Golf Club. Abu Dhabi Tourism & Culture Authority (TCA Abu Dhabi) and Championship title sponsor HSBC have confirmed preparations are in full swing ahead of the milestone, which will reflect the event’s remarkable growth over the past decade. Teeing off in 2006 under the former Abu Dhabi Tourism Authority (now TCA Abu Dhabi), the Championship is recognized as one of the leading events on the European Tour. It has welcomed some of golf’s biggest names over the years including Tiger Woods, Rory McIlroy, Martin Kaymer and Phil Mickelson. Last year the event attracted more than 63,000 fans and was broadcast to a global TV audience of more than 436 million people. 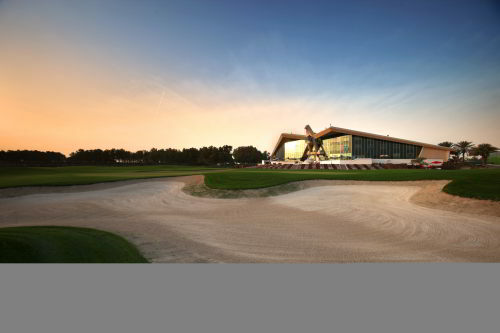 Since its inception, the Championship has teed off every January at Abu Dhabi Golf Club, evolving to become the jewel in the desert that forms part of the Tour’s ‘Gulf Swing’. Each year, the event welcomes one of the European Tour’s leading player fields who vie for the iconic Falcon Trophy and a cut of the $2.7million prize purse – the richest in the region. Global bank HSBC joined as title sponsor of the Championship in 2010 and has played a key role in driving the event forward. Working in partnership with TCA Abu Dhabi to attract the game’s greatest players to the emirate, the bank has also helped to further enhance the Championship Village into one of the best off-course entertainment venues of any regional sporting event. The Championship was initially created to further enhance Abu Dhabi’s profile as an international golf tourism destination, and showcase the world-class offering of the one-stop Golf in Abu Dhabi booking and packaging initiative. With three championship-standard courses within a 20-minute drive of the UAE capital, Abu Dhabi’s golf tourism offering has seen growth year-on-year. Overseas rounds increased by a massive 50 percent in 2012-2013, with total rounds also increasing by 15 percent during the same time. The first quarter of this year has continued the trend, with overseas rounds up by a further 19 percent. Golf in Abu Dhabi has created tailored packages to suit all types of players and itineraries, including packages for the 2015 Championship. Championship packages include five nights’ accommodation in one of Abu Dhabi’s leading hotels, two rounds of golf on Abu Dhabi’s Championship courses, season passes to the Abu Dhabi HSBC Golf Championship, as well as an array of stunning tourism attractions. To top this off, all visitors who book packages will enjoy a complimentary clinic with a world top 30 player. Visit http://www.golfinabudhabi.com for additional details concerning Championship package. Earlier this year, the Championship was also billed, for the second year running, as the region’s best professional sporting event at the Middle East Sports Industry Awards (SPIA). For more information about the Abu Dhabi HSBC Golf Championship, visit http://www.abudhabigolfchampionship.com. For more information about the Abu Dhabi Tourism & Culture Authority, visit http://tcaabudhabi.ae/en or http://visitabudhabi.ae. The Championship is renowned for throwing up tough and exciting challenges for the world’s best – from Henrik Stenson setting a new Asian long drive record from the wing of an Etihad Airways A330; to Luke Donald taking on the ‘world’s biggest bunker’ in the Liwa Desert. In 10 years, the Championship has grown exponentially, from welcoming 22,000 visitors in 2006, to over 63,000 visitors in 2014. Across 10 years of the Championship, there have been nine holes-in-one – more than half of which occurred on the National Course’s par 3 Hole 12. Martin Kaymer made himself a firm fixture in the Championship’s history books, becoming the youngest, and only wire-to-wire winner at 23 years and 24 days in 2008, and scoring the largest winning margin (eight shots) and lowest 72 hole score (-24) in 2011. In its 10 year history, the Abu Dhabi HSBC Golf Championship has welcomed six current and former number ones including Ernie Els, Lee Westwood, Tiger Woods and Rory McIlroy. Since HSBC came on board as the Championship’s title sponsor, the Championship Village has become the centerpiece of the action, proven in 2013, when fans watched Rory McIlroy unexpectedly take on former British number one tennis star Tim Henman on the mini court. The highest ranked player to win the Championship was Martin Kaymer in 2011, who consequentially displaced Tiger Woods as number two in the world rankings, shortly before going on to become world number one. Numerous changes have been made to the National Course over the past 10 years to increase the degree of difficulty and provide a searching but fair test for the world’s leading players, including 12 new tees and 23 new bunkers. The Abu Dhabi HSBC Golf Championship has won the accolade of Best Professional Sporting Event at the Middle East Sports Industry Awards every year since they were established. Over the past 10 years, 14 Major winners have descended on Abu Dhabi Golf Club’s National Course with hopes of Championship glory, however only the newly crowned US Open Champion, Martin Kaymer, has achieved it. Abu Dhabi Tourism & Culture Authority conserves and promotes the heritage and culture of Abu Dhabi emirate and leverages them in the development of a world-class, sustainable destination of distinction that enriches the lives of visitors and residents alike. The authority manages the emirate’s tourism sector and markets the destination internationally through a wide range of activities aimed at attracting visitors and investment. Its policies, plans and programs relate to the preservation of heritage and culture, including protecting archaeological and historical sites and to developing museums, including the Louvre Abu Dhabi, Zayed National Museum and Guggenheim Abu Dhabi. The authority supports intellectual and artistic activities and cultural events to nurture a rich cultural environment and honor the emirate’s heritage. A key authority role is to create synergy in the destination’s development through close co-ordination with its wide-ranging stakeholder base. For more information, visit http://visitabudhabi.ae. (VIENNA, VA) – Billy Casper Golf (BCG) – the largest owner-operator of golf courses, country clubs and resorts in the U.S. – has unveiled the grand prizes for the fourth annual World’s Largest Golf Outing on Monday, August 11 to benefit Wounded Warrior Project (WWP). All players are eligible to win a trip for four to the Nike Campus in Beaverton, OR, for custom club-fitting and other merchandise. The team that raises the most money for WWP will win a trip for four to Pinehurst Resort (NC), site of last month’s men’s and women’s U.S. Open Championships, to play the famous No. 2 golf course and stay at the iconic Carolina Hotel. The winning team from each participating course – anticipated to be more than 120 in 28 states – will be entered into a drawing for tickets to the 2015 PGA Championship. Other prizes include equipment and apparel from leading golf brands. More information and to register: http://www.worldslargestgolfouting.com. More engagement: Facebook, Twitter, Instagram (#WLGO14). Golfers are encouraged to Tweet @wlgo_bcg and @BillyCasperGolf using #WLGO14 with photos and updates during or after the day. World’s Largest Golf Outing is a simultaneous golf event played at more than 120 BCG-managed courses in 28 states and is open to all golfers regardless of ability. A USGA handicap is not required. Golfer check-in, shotgun start and entry fee – which includes a $10 per player donation to WWP, round of golf, cart rental, range balls (where applicable), lunch, awards reception, on-course contests – vary by course. Part of event proceeds and all donations from non-players benefit WWP, the national organization whose mission is to honor and empower Wounded Warriors – some of whom will be playing in the World’s Largest Golf Outing. Teams are encouraged to raise additional funds to support the worthy cause; donations to WWP unrelated to event participation are made at http://www.worldslargestgolfouting.com. Last year, BCG hosted more than 10,000 golfers, including 70 wounded warriors, at 110 of its courses in 28 states and raised $735,000 for WWP, topping the 2012 event that totaled 7,800 golfers and $400,000 to WWP. Since its inception four years ago, the World’s Largest Golf Outing has donated more than $1.1 million to WWP, the largest amount ever via a single-day golf event. BCG forecasts another record-breaking charity donation this year. Wounded Warrior Project is recognizing its ten-year anniversary, reflecting on a decade of service and reaffirming its commitment to serving injured veterans for their lifetime. The mission of Wounded Warrior Project (WWP) is to honor and empower Wounded Warriors. WWP currently serves more than 50,000 warriors and nearly 7,000 family members through its unique 20 programs and services. WWP’s purpose is to raise awareness and to enlist the public’s aid for the needs of injured service members, to help injured servicemen and women aid and assist each other, and to provide unique, direct programs and services to meet their needs. WWP is a national organization headquartered in Jacksonville, Florida. To get involved and learn more, visit woundedwarriorproject.org. Founded more than 20 years ago in cooperation with golf legend Billy Casper, the company is the largest owner-operator of golf courses, country clubs and resorts in the U.S. with more than 150 properties in 28 states. Headquartered in Vienna, Virginia with regional offices across America, BCG directs course and property maintenance, staffing and training, clubhouse operations, food-and-beverage, merchandising, golf instruction, marketing and public relations, special events and financial management. Buffalo Turf & Landscape Company provides golf course agronomic programs with a new fee-for-service structure that allows owners unfettered visibility into actual activities and costs.